So, without further ado…. The Dreamcatchers (drumroll)! 1. 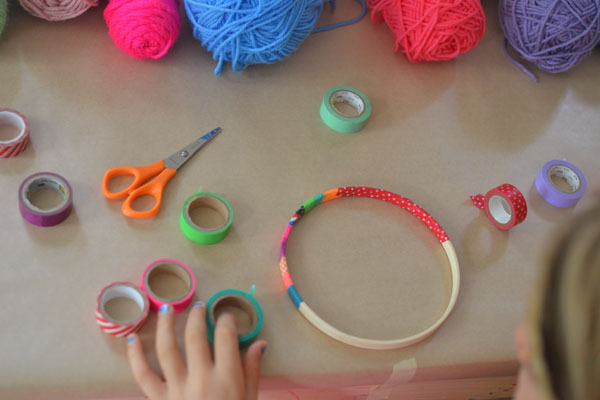 The kids started by covering their hoop with little pieces of washi tape. They can either tear the tape or use small scissors. Anything goes! 3. Next came the sewing part. 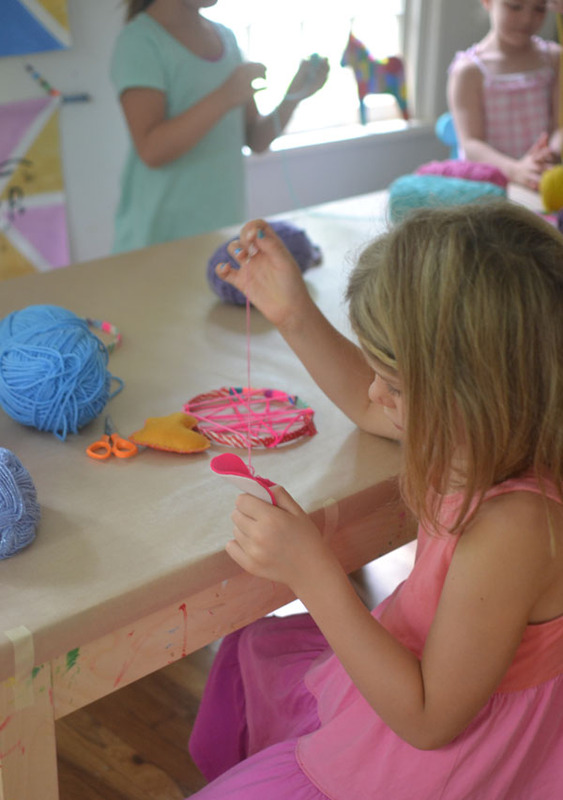 I had a nice pile of different colored felt left over from my garland project so I let the kids choose their own two colors for their heart. I drew a heart on paper first then used it as a template. The hearts are about 3.5″ wide. 5. We left a little opening to put in the stuffing. I stitched the heart closed for them. 6. When they finished sewing, I had a station set up with the paper pinwheels (pre-made in the interest of time) and watercolors. I did not have a chance to take any photos, but here is my pinwheels post where you can see how fun it is to paint 3D paper! (It takes four pieces of paper to make one pinwheel, my paper size was 3″ x 4″.) We let them dry a bit and then punched a hole at the top. 8. The last step was the most fun – putting it all together! 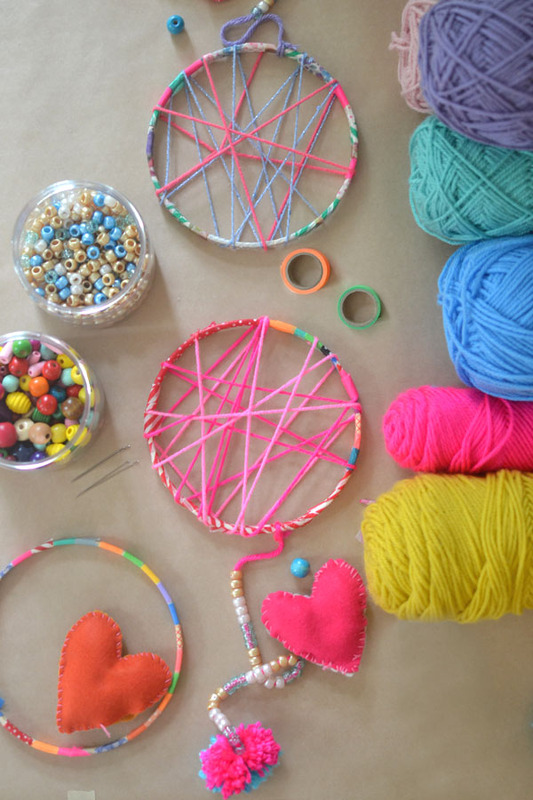 I cut four pieces of string; one for each pom-pom, one for the pinwheel and one for the heart. (I used a larger needle to get the yarn through the top of the felt heart.) They strung beads on some of the strings. I also brought out some old buttons which they loved. Then I tied them onto their hoop at varying lengths. 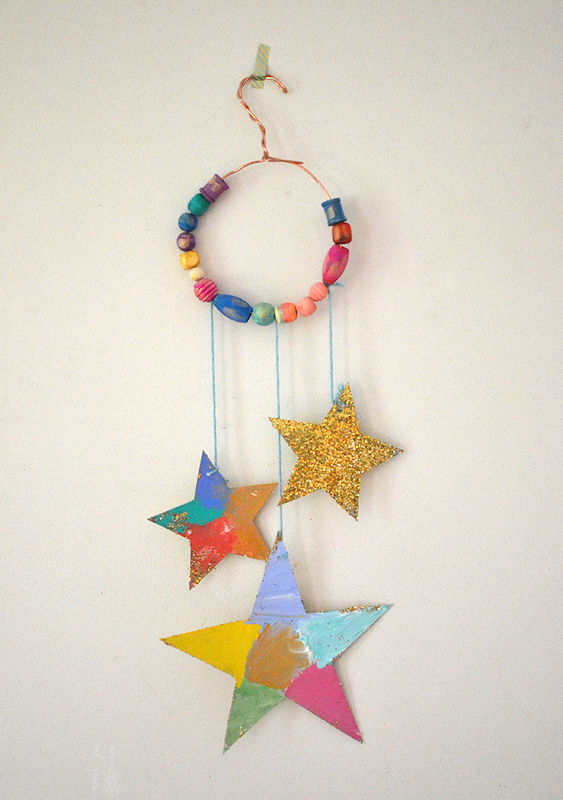 I found some old, colored wire and I made a hook at the top (which I secured with the hot glue gun). 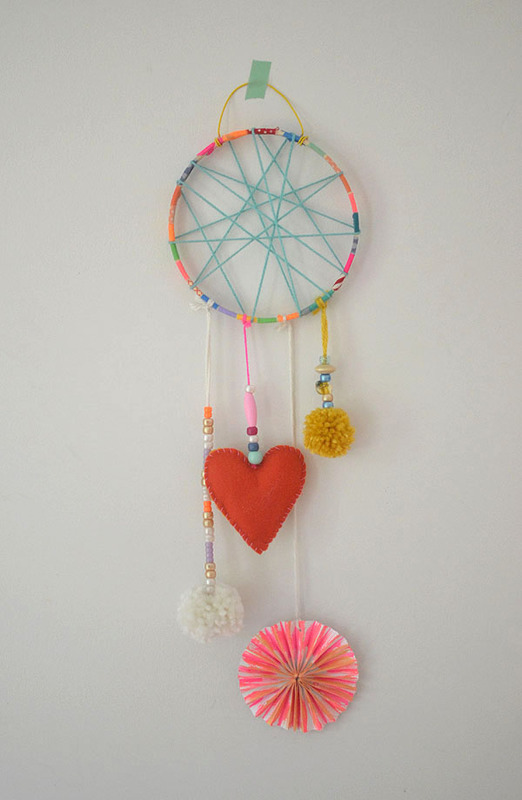 Ready to hang up and catch those bad dreams! I forgot to mention that I looked up the history of the dream catcher so that I could share it with the kids. Did you know that they started in the Native American culture? 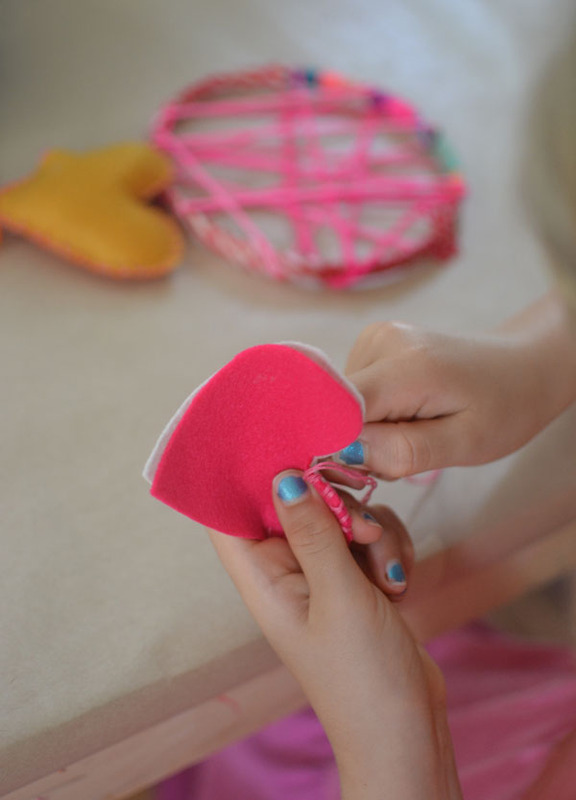 Making dream catchers was really fun. I made one, too, and now I’m hooked. There are so many variations and possibilities! Let me know if you make one, I’d love to see! They look just beautiful. Great job kids! Oh my goodness these are incredible!!!! Hi! 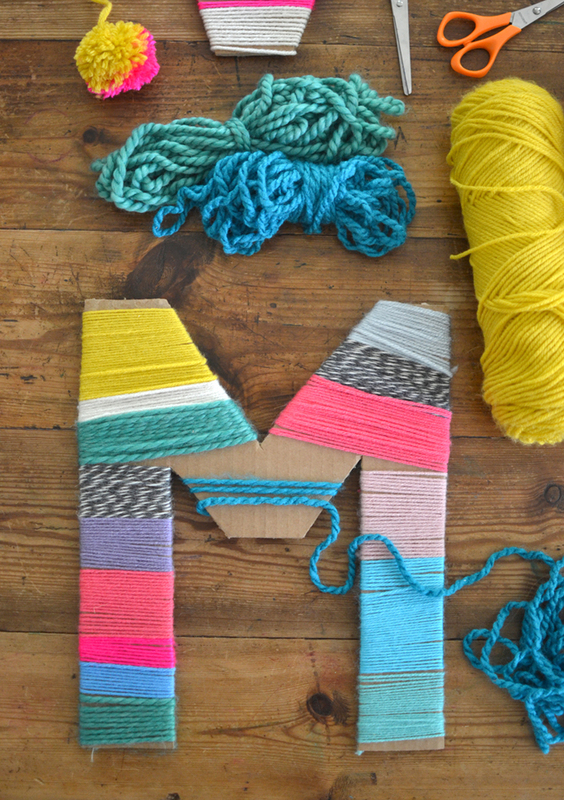 Can you please tell me how to wrap the two colored yarns around the hoop? I dont have a clue… And how do you guarantee they dont fall from the hoop? Thank you so much! These will be my xmas gift for everyone! Hi! My name is Shannon and I’m ‘jumping into’ someone else’s post. Sorry!! I teach 6-9 year old Sunday School and I have a new student reporting nightmares. 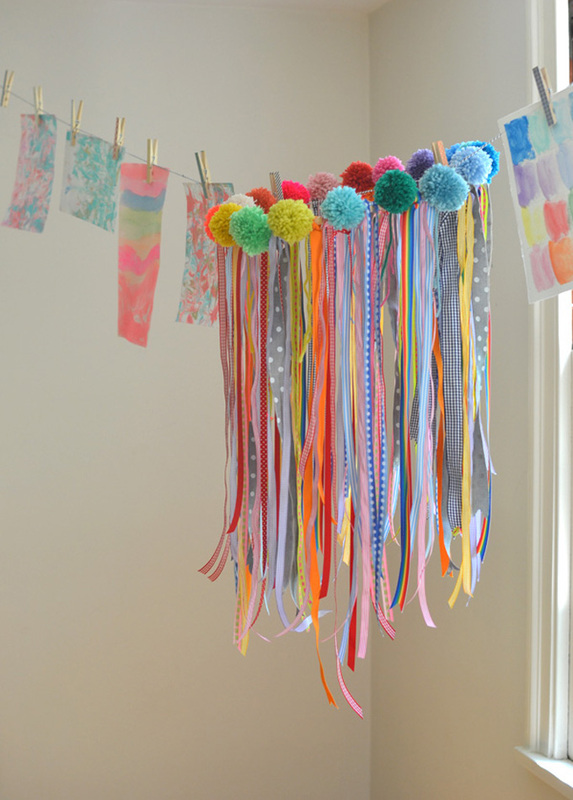 The older kids were quick to say “You need a Dream Catcher” and that’s all the encouragement I need to say “PROJECT! 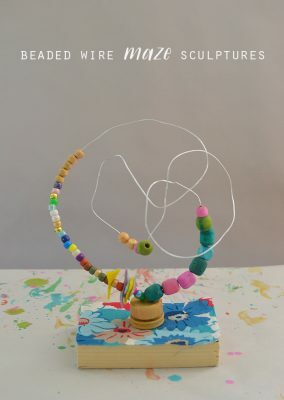 !” Although my Christian Class will be making “Christ Catchers.” It would be really helpful to know the pattern you used for the web within the ring. Is it just random? Thanks for your help! 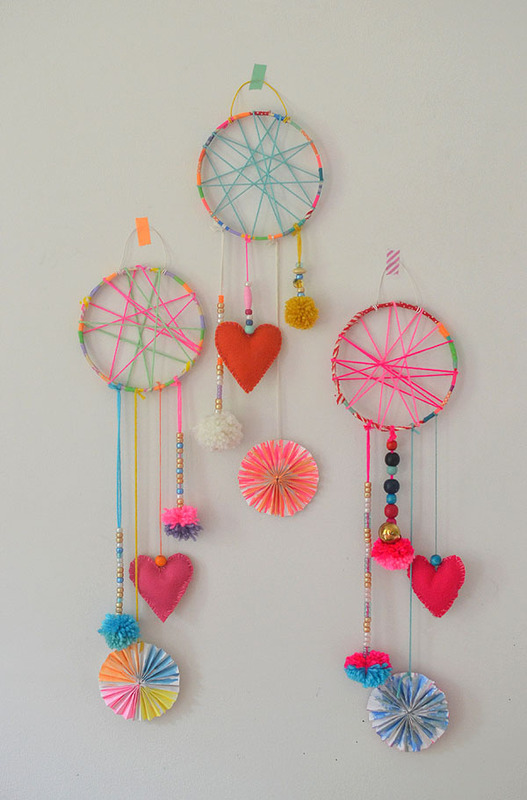 I love these beautiful Dream Catchers! Hi! Can you tell me what age you think this would be good for? 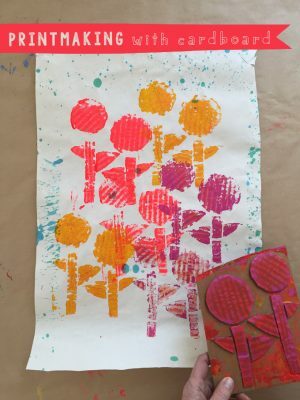 They’re beautiful– can’t wait to make them with my gang! I have not been able to find any without the screws. You found them without? 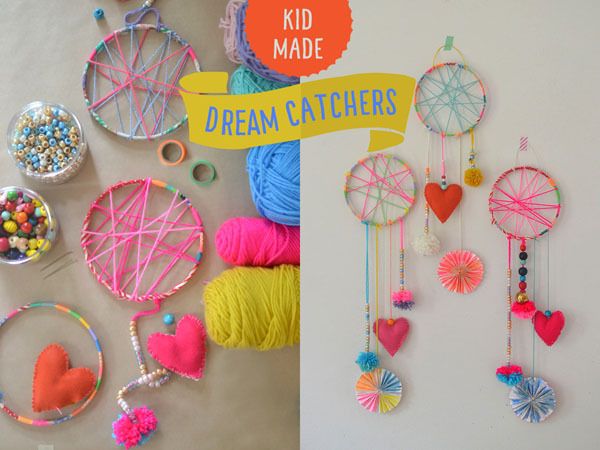 All of these dream catchers look like a lot of fun! It might make for a great family activity to make some. I’m sure ours won’t look as good as some professionals or what you pictured, but it will be a great time anyway. Thanks for the awesome article! 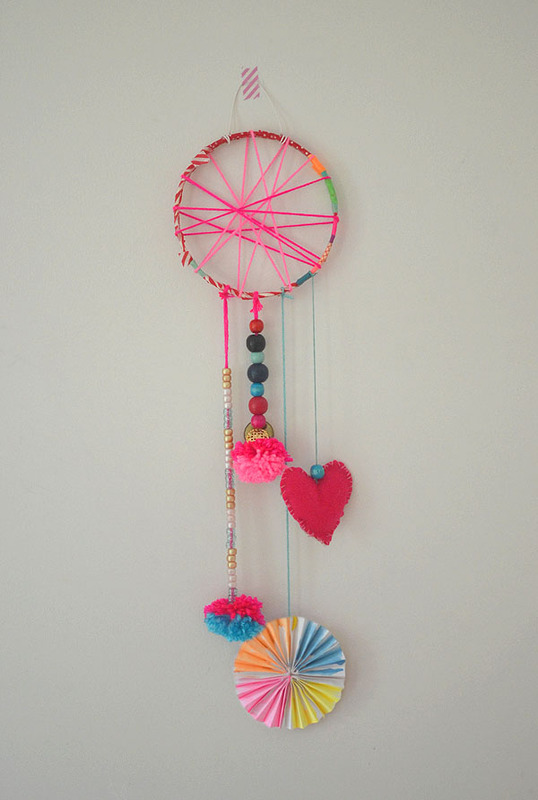 We finally finished a dream catcher – I am not sure what ages of kids you made these with, but it is a really long project to finish. The results are as advertised though – they are really cool to make. Also, when I had a dream catcher long ago I read that there is to be a hole in the center with a bead or something to “attract” the bad dreams to the hole – then the bad dreams go out the hole, and the good dreams get caught in the “web” here in the hoop. I am using this as a way to get my son to stay in his room at night! We just took some yarn and pulled a hole into the center (imperfectly) by wrapping the yarn that crossed through the center away a bit…and then hung some beads in the middle. Turned out great. Can you please tell me how long it took to do this project? I’m thinking of doing it with my Girl Scouts. Hi! I have a question about the embroidery hoops you used. Did each child use a fully assembled hoop, or did you divide the hoops into two and give one half to each child? Would it make a difference either way? Also, I don’t see the little twisty part at the top of the hoop in your images. 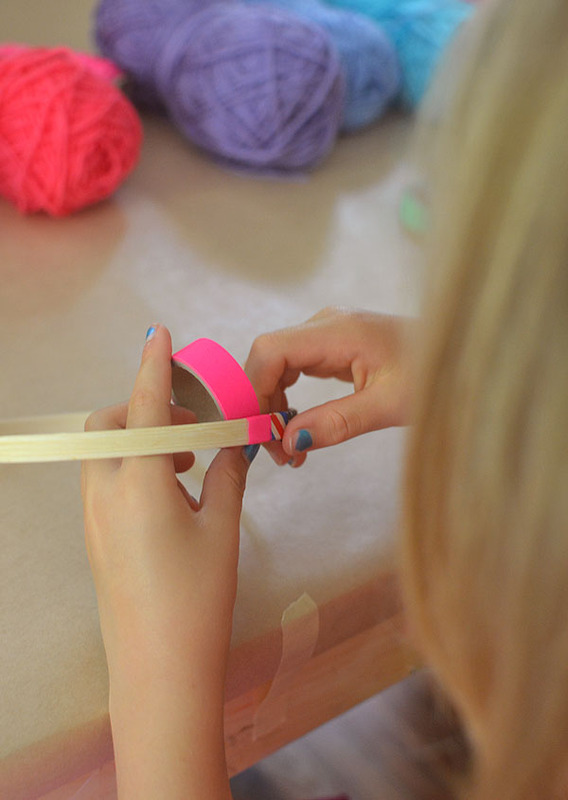 Did you unscrew it somehow, or cover it up with Washi tape and we just can’t see it? What do we do about that bit? My daughter and her friends loved these and made them for her birthday party. The only mistake I made was buying “glitter” washi tape. 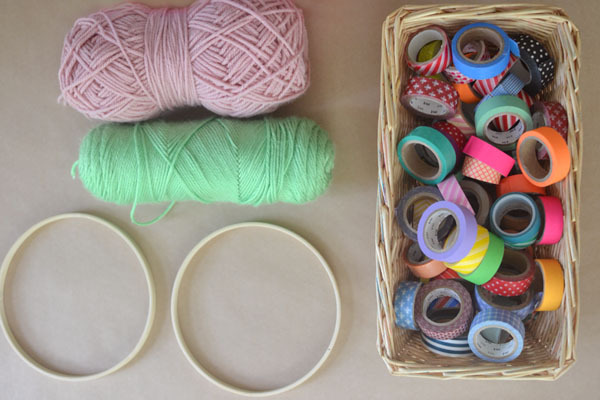 When wrapping the loop, the glitter washi tape will not stick if it is overlapping on the glitter side. Wish I ouldve known bc it took so much longer than necessary. After lots of glueing, they still came out super cute. Just an fyi for others. When you made these did you only use one part circle/ hoop or did you use both I do not see the screw or knob in your photos ? Ho did you attach the Pom poms to the string? Approximately how much in materials did each one take? 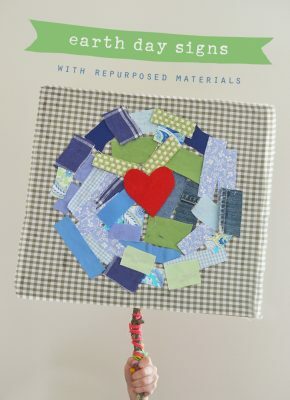 My PSR class would like to make some for a local children’s hospital and I’m trying to figure out how much in supplies. We’d need to make about 180 of them. Thanks! Hi! These look great!! What size hoop would you suggest? I’m thinking the smaller 6” size would be better to keep tension easier? Or larger? What do you think? My age range is 5-8 year olds. Thanks! !